Fall in love with fall. When summertime starts to fade away in such grace and elegance. Slowly withdrawing the juice of life from the outer to the inner – a celebration of life. As Nature prepares for the dark and cold season – releasing – colors and textures are changing, and so are we in this cycle of life. In this seasonal transition, we are called to rel-ease the patterns of our mind that leave the needs of our body behind. Believe me, this temple of ours deserves our attention, deserves our love. Selfcare is not a luxury, it is the appreciation of yourself on all levels. According to Ayurveda – the science of life – the element of Air & Space, the so called Vata Dosha is high in fall. The quality of air is quick, dry and cold. 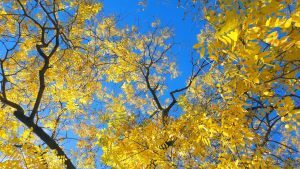 These attribute are increasing in autumn and people, especially the once who naturally have more Vata Dosha in their constitution, are prone to experience more restlessness, coolness and dryness. We are fortunate to heave well functioning heating systems in our homes, but at the same time they have a drying effect as well. So lets counterbalance this, shall we? STEP 2 – eat warm – Oh gosh, I cant even tell you how much my belly and more so digestion responds to what, when and how I eat. Ideally you start with a warm breakfast, enjoy a slow cooked lunch as your biggest meal and close with an earlier and lighter dinner. That might sound complicated, but it really isnt that much. 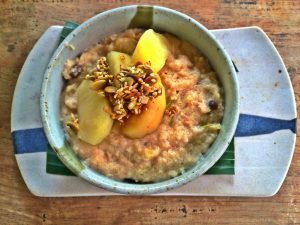 A breakfast porridge is easy and also quick to make. There are many variations and you can add whatever your tongue likes: experiment with various grains apart from oatmeal like couscous, rice, quinoa etc, combine it with almonds, seeds, seasonal fruits and spices such as ginger, cinnamon & cardamon; a dash of rock salt and your favorite milk. Get creative! Lunch can be stews from loads of root vegetables. Have more good fats, such as ghee, olive oil or avocado. Play with plant based protein sources like tofu, quinoa, lentils, beans, peas. Spice it up with some ginger and fresh herbs. What about some ginger tea and little dark chocolate in the afternoon to keep you up? STEP 3 – move – this is essential to keep our bodies and minds healthy. Walk instead of taking the tram, ride bicycle, go to yoga. dance, jump, pump if you like. Keep your muscles working without strain. I personally recommend Hatha Yoga or a Slow Flow with focus on core to keep the Agni (inner fire) steady. It is essential to counterbalance the more Yang and fiery practices with soothing Yin sequences and restoratives. So get your bolster out, put your legs up the wall, bridge your heart over a block and rest in a deep 12-18 min. savasana. If you are new to these practices go and check out my classes and my upcoming <rejuvenate your ressoure> workshop. STEP 5 – oil oil oil – inside – outside – Oiling is the heart of Ayurvedic treatments. Mineral rich sesame oil nourishes your tissues. We already stated to use more high quality oils in your cuisine, but now you want to apply oil onto your skin. This is not merely skincare. It is so much more then that. Oiling your body is an amazing way to love yourself while detoxing and nurturing the various layers of your tissues and lubricating your joints. It also soothes your nervous system, helps to unwind, to deeply relax. 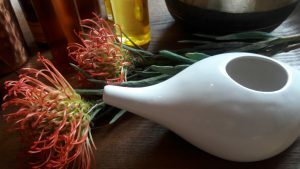 Ever since I discovered Ayurvedic oil massages, I am fascinated by how this ritual is mothering me. This gentle coating of warm oil makes me feel safe, cared for and loved. I guarantee that you will feel that too. Thats why I am about to prepare a online guide on how to self-massage, so you can gift yourself this incredible powerful selfcare and selflove tool. If you do not want to wait or feel more like receiving this sacred Selfcare ritual, you can inquire about bookings here. You might want to get a real Selfcare boost at our < Yoga & Ayurveda Selfare Retreat > in Goa, South India beginning of March. For a deep inner cleanse and to establish a steady yogic lifestyle you may want to join the more traditional < Yoga & Karma Pilgrimage > in the Indian Himalayas in April 1.-11. 2019. Feel free to get in touch and to share your experiences in the comment section below. Thank you for the lovely reminder dear much needed. so sweet to hear from you, wishing you all the best. lest catch up, shall we?